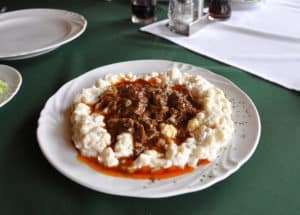 Hungarian cuisine is marked by various influences, mainly those of the Austro-Hungarian Empire, the East (Turkey and the Balkans) and the gypsies. 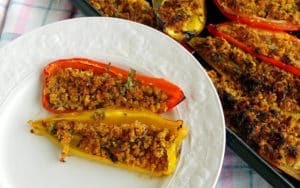 The hungarian cuisine is also distinguished by the privileged use of Hungarian paprika, a bright red that refers to both the spice and the vegetable (ripe fruit of the pepper). Hungarian paprika is of a remarkable quality and the type used in many dishes is not spicy but reveals a fruity aroma ideal for flavor. In Hungarian food shops in Budapest, you can buy sweet paprika (‘edes’) or strong paprika (‘ csipős). A typical Hungarian meal consists of soup, a main course and dessert. Hungarians accompany their meals with a salad of cucumbers, tomatoes or cabbage offered to you in addition in many restaurants in Budapest. 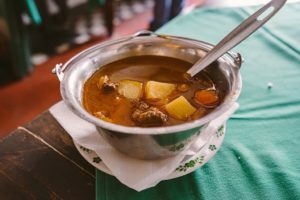 Goulash soup (in Hungarian ‘Gulyasleves’) is one of the most famous dishes of Hungarian cuisine and is well known beyond its borders. 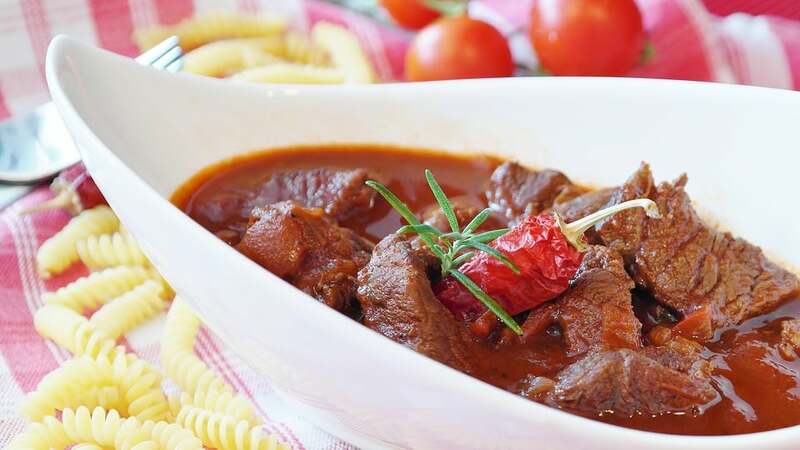 Goulash is composed of meat (usually beef), vegetables (peppers, tomatoes…), potatoes, onions, garlic and paprika. 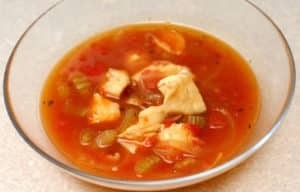 This thick and tasty soup is accompanied by bread and may serve as a main dish. Halászlé is a Hungarian soup composed of various freshwater fish (carp, perch, pikeperch, pike…), onions and paprika. The Hungarian writer, Tömörkény István, called it “fish with paprika” because the soup was plentiful. 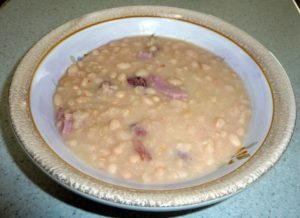 Bableves soup is a classic of Hungarian cuisine–a soup made from different vegetables, white beans, smoked meat, raised with paprika. 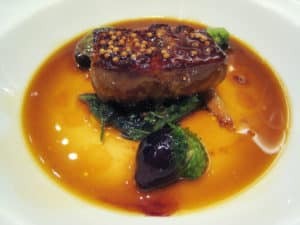 Hungary is the third largest producer of goose liver, a great local specialty. 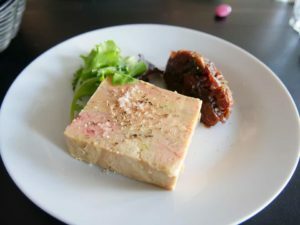 Hungarian foie gras is consumed in its raw form, but you will also find it fried in many restaurants. 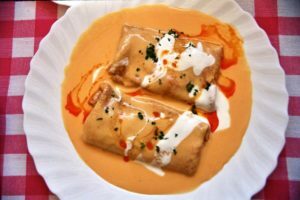 The ’hortobàgyi palacsinta’ is a pancake with minced meat, served hot with a paprika sauce. Pörkölt is a stew made from meat, onions and paprika: it is often accompanied by a small Hungarian pasta called ‘nokedli’. 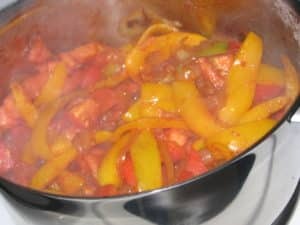 Lécsó is a ratatouille of tomatoes, fresh paprika and onions. There are many versions: with sausage, eggs, rice…Let yourself be tempted! 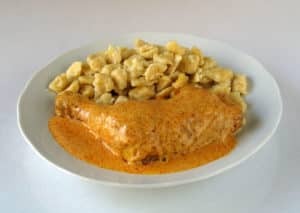 Paprika chicken, ’paprikás cirke ’in Hungarian, is chicken with a sweet paprika sauce, usually accompanied by ‘galuska’, small pasta resembling gnocchi. Töltött paprika is made of paprika stuffed with meat, onions, rice and tomato sauce. 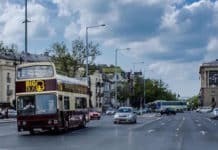 You can discover these Hungarian culinary specialties in the Hungarian restaurants of Budapest such as Menzza, Bock Bistro, Múzeum, Náncsi Néni, Hungarikum Bistro, etc. cited in our section on the restaurants of Budapest on this link. Also discover Hungarian desserts in our article on ‘Hungarian pastries to be tasted’ on this link. 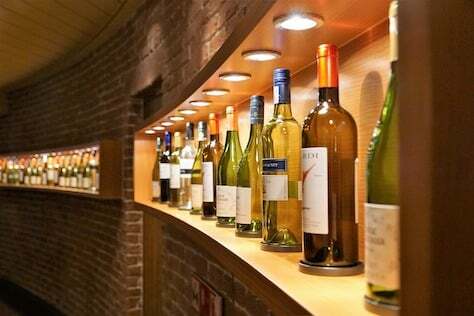 Hungary is a country of wines. 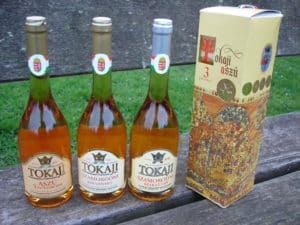 One of the most famous is Tokaj, a golden wine named after the city of Tokaj, 200 km northeast of Budapest. The pride of Hungary, the powerful sweet wine, of great aromatic richness, has been classified as the world’s heritage of humanity. Louis XIV already said that tokaj was “the king of wines and the wine of kings“! Tokaj is differentiated from other sweet wines by a double winemaking process using a dry wine consisting of Furmint and Hàrslevelü grapes in specific proportions and grapes dried by botrytis in varying quantities to create the wine of Tokaj Aszú. The term “Aszú” literally means “grapes”. A “puttony” is a hood that contains 30 kg of grains “aszú” and represents the unit of measurement that defines the sugar content of “Aszú” wines. The minimum is three and the maximum is seven. The higher the number of puttonyos, the higher the sugar content–and the higher the price. This sweet sweet wine is comparable to Sauterne and is very aromatic. Tokaj “Aszú” Hungarian wines are consumed as an aperitif or at the end of a meal. They also go well with goose liver, prey, blue cheese or desserts. 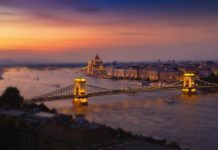 Discover the Hungarian wine regions, their histories, grape varieties and characteristics and taste a selection (accompanied by Hungarian specialties) guided by a sommelier. There are two-hour class every evening in downtown Pest, in English only. Do you want to meet local winegrowers and discover Hungarian wines? 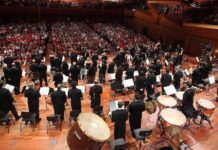 We spotted a half-day program in the village of Etyek located 30 minutes from Budapest (transfer to and from Budapest by minibus). 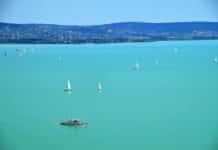 Discover various vineyards, cellar visits and wine tastings from each farm, concluded by a Hungarian country meal. Visits are in small groups (14 people maximum) and your tour guide will speak English and German. The pálinka is a traditional Hungarian brandy whose alcohol content varies from 35 to 70%. It is considered a national drink and can be produced from apples, pears, plums, apricots, raspberries, grapes and cherries. 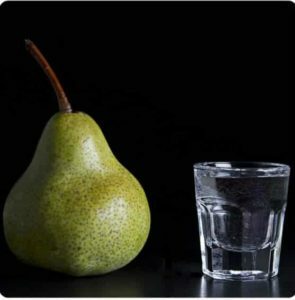 Choose your fruit and taste pálinka! 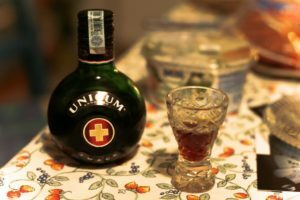 Unicum is a bitter Hungarian liqueur, based on forty medicinal plants, invented in 1790. This alcohol at 40° can be consumed as an aperitif or digestive. 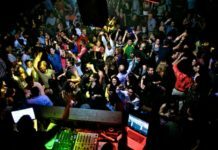 Hungarians grant it ‘sanitary’ virtues that help digestion and fight against the harmful effects of a heavy consumption of alcohol the next morning! 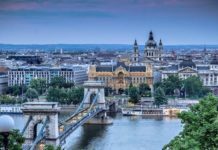 To discover Hungarian cuisine in Budapest, check out our article on our favorite restaurants in Budapest on this link! If you are curious about Hungarian gastronomy, we recommend you visit the Great Market Hall in Pest to discover the basics of Hungarian cuisine. 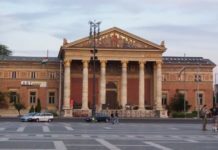 You will find all the information in our article on the ‘must-sees of Budapest’ on this link.